I almost fell for a scam today. No, not the Russian Spy Scam that I wrote about yesterday. This is a phone company slamming scam and almost falling for it is something that I’m not proud of. 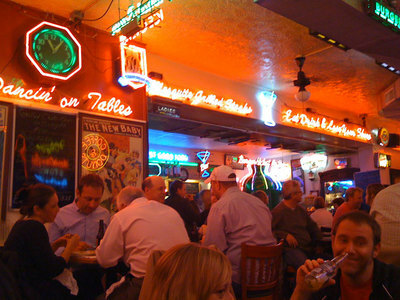 But, instead of wallowing in my near humiliation in private, I’ll blog about it as a public service. I received a phone call today from someone who said that they were an employee of Cincinnati Bell and that they were calling to tell me that Cincinnati Bell was switching billing providers and that they were required by the FCC and the Federal Privacy Act to inform us and have us agree to the change. That seemed innocent enough. She said that the costs would remain the same and that it was just a different company that would handle the printing and billing of our account. That seemed plausible to me, but something about this made me feel a little apprehensive about it. It seemed a little strange to me that an internal matter like billing needed to be approved by the customer. I mentioned that to the representative. She agreed that it was a hassle and but that there was a note that was sent out in the last phone bill about the change. She said that most people had not seen the note and that she would be happy to fax me a copy after she got of the phone with me. She also said that Cincinnati Bell was required by the FCC to make this call. I told her that I was concerned about calls like this because I was getting a lot of scam calls offering to list us in “yellow pages” or other services that I don’t want that we end up getting billed for. She said that she understood and that as a customer, it was always important to make sure that you were speaking to a Cincinnati Bell employee like she was. She went on to explain that if I agreed to the new billing company change, my billing costs would remain the same, but would now be processed by NSBI instead of the old company. She said that to make the change I would be asked some simple verification questions by a third party verification service. She said that I would have to answer “yes” to all of them or I would be routed back to another representative to start the process over again. She said that she would read each question to me now to explain it to me so that I would understand what I was saying “yes” to. The first several questions were basic, over 18, address, and phone number, etc. The last couple of questions were bothersome to me: “Do you understand that NSBI will be adding $14.95 to your bill”. She said that I should answer “yes” because the $14.95 charge was something that would be absorbed by Cincinnati Bell and not passed on to me. The last question was “Do you agree that NSBI would handle long distance charges, inter and intra-state calls. She said that “yes” was required because NSBI would be handling the billing for Cincinnati Bell long distance calls. I was very, very uncomfortable with this but she really sounded official and sympathetic to my concerns. She wasn’t a strange voice from an Indian call center and she sought to calm my concerns by saying that she would fax me the information as soon as she transferred me to the verification service. I agreed and I was transferred to the verification service. At this point I was extremely suspicious and I don’t know why I continued to go through with this. Maybe that explains why so many people are taken in by scams. I had seen the red flags, but I only slowed to question them, not to stop. The guy from the verification service who came on the line said that he was with such and such verification service and that he had some questions to ask. When he got to the phone numbers of my business, he read back my phone and my fax numbers and asked if those were all the numbers I had. I actually have 4 more phone numbers that roll into my main voice line. They would have known that if my numbers were sent to them by Cincinnati Bell. I was very suspicious but once again I didn’t stop and answered the questions like I was told to. Immediately after the call I went to look at my fax machine and there was nothing there. No note from the Cincinnati Bell employee explaining the billing change. I immediately called Cincinnati Bell and talked to one of their business representatives. She told me that no change in billing was happening and that it was probably a scam. She checked my account and told me that I was safe, that I had locked the account down last year against third party billings and portings. Any change to my phone account would have to be authorized by me directly. So, I managed to save me from myself last year! She said that she would report this scam to her supervisor, but that I would be fine. This was a total con-game. The verification service was legitimate, but the woman who called was a fraud. She almost successfully got me to change my phone service by the way she framed around the questions from the verification service. Afterwards, I realized that she also managed to get an additional number to slam, my fax number that I had given her to fax me the billing company change information. It was a very smooth job and pretty sophisticated. I’d like to think that I’m smart enough not to get scammed, but this came pretty darn close. 1. Never agree to say “yes” to anything unless you agree with it. 2. Never agree to anything with a telecommunication company that calls you. If you want to make a change in your phone service or have a question, call your phone company. 3. Call your phone company and have them lock down your phone account. Make sure that third parties can’t bill you and that your number can not be ported without your verbal authorization. 4. Listen to yourself if you feel uneasy. There’s probably a reason for it. This is a pretty funny SPAM that I just got. They even incorporated current events into it! Seriously, how can anyone fall for this? I know this mail will bring lots of surprises and inquisitiveness to you since there was no previous association before now between us, Please do not be offended & I will understand completely if you cannot be of assistance to me. I am the wife of Late Mr. Alexander Litvinenko (Mrs.Marina Litvinenko), former Russian spy. Please I want you to assist in transferring my late husband deposited funds from a financial Diplomatic Vault with one of the biggest banks in the world. All I need from you is to take in charge of the funds transfer to your country for charity purpose and use your discresion on investment without any publicity involvement. Human rights groups are hailing Judge Raingeard’s decision. “I am extremely happy with the decision,” said Richard Sedillot, a lawyer for two Paris-based human rights groups who filed a complaint against the show’s organizer. Sedillot said that given the well-documented human rights abuses in China, he fears some of the cadavers on display come from executed prisoners. Sedillot said the organizer could not prove that the bodies on display were donated with consent and that the exhibition itself violates French law. It’s a major step for the French to shut down the exhibit. As long as the bodies used are Chinese, there will always be questions as to whether or not they were used without consent. Just received this press release from the Cincinnati Contemporary Art Center. The first one-person museum survey of Fairey’s work, Supply and Demand coincides with the 20th anniversary of the artist’s controversial career. It gathers over 80 works created from 1989 to the present, and traces the development of his career from the earliest Obey imagery to his current efforts. Featuring the multi-layered renderings of counter-cultural revolutionaries and rap, punk and rock stars which carry his iconic use of black, white, and red, the show includes screen prints, stencils, stickers, rubylith illustrations, collages, and works on wood, metal, and canvas. First shown at the CAC in Beautiful Losers in 2004, Fairey has developed into one of the most influential street artists of our time. Despite breaking many of the spoken and unspoken rules of contemporary art and culture, his work is now seen in museums and galleries, as well as the worlds of graphic design and signature apparel. Building off of precedents set by artists such as Andy Warhol and Keith Haring, Fairey easily shifts between the realms of fine, commercial, and even political art. Recently, his portrait of Barack Obama drew a new level of attention to the artist’s work, and has been acquired by the National Portrait Gallery. Fairey was born in 1970 in Charleston, South Carolina, but lives and works in Los Angeles. He graduated from Rhode Island School of Design in 1992 with a Bachelor of Fine Arts in Illustration. crime and injustice where he finds it. I think this guy is serious. I wish I could embed the video, it’s pretty funny. 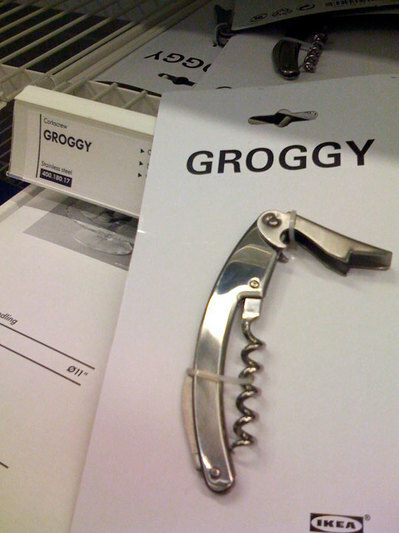 Strange (at least to us) Swedish names for Ikea products are the norm, but where does “Groggy” come from? 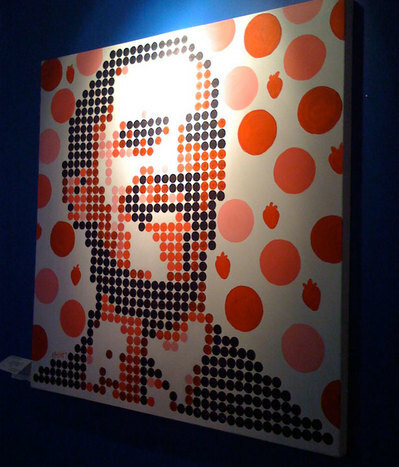 Saw this Obama painting in a restaurant while in Chicago over the weekend. It’s Strawbama by Ella Wijt. Acrylic on canvas. A time lapse video of the installation of Shepard Fairey’s Lance Armstrong Livestrong Mural.